TENA Flex Maxi Briefs are breathable one piece belted brief style Adult Diapers for Incontinence manufactured by SCA. 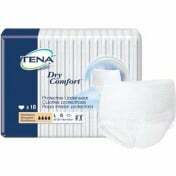 TENA Flex Maxi Briefs promote less heat build-up against the skin to keep incontinent adults more comfortable. 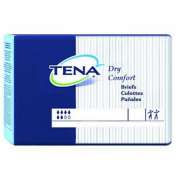 TENA Flex Maxi Briefs help promote overall skin health by keeping you drier. Flex Maxi Briefs are easier and quicker to change than traditional adult incontinence diapers. 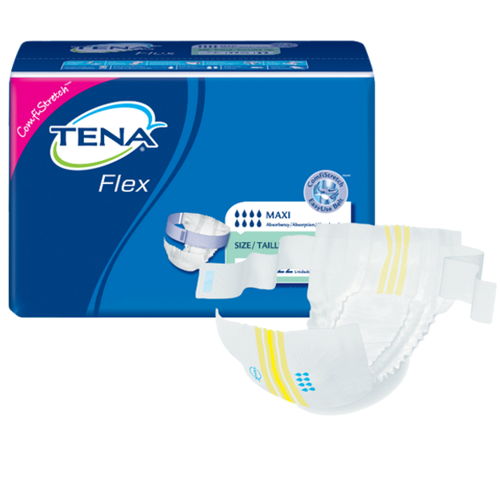 The TENA Flex Maxi Briefs are designed for those with moderate to heavy incontinence. 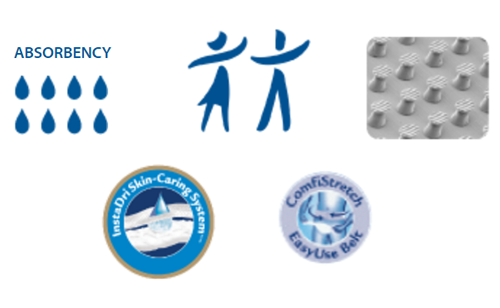 TENA Flex is highly rated by caregivers for individuals who are bedridden, require assistance or have sensitive skin. 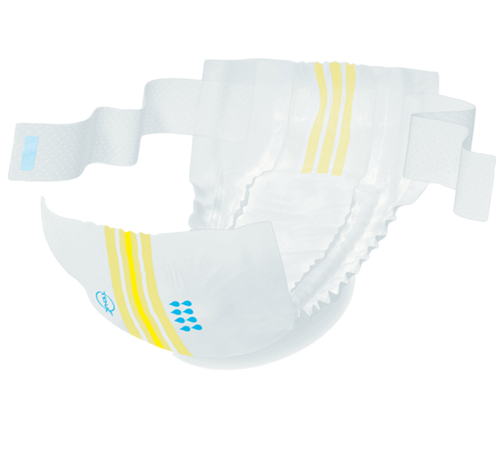 The unique belted Brief design minimizes the need for caregivers to lift incontinence patients. TENA Flex Maxi Briefs reduce the risk of back strain on caregivers, making changing less intrusive for the wearer. Incontinent Adults who wear the Flex Maxi Briefs appreciate the thin discreet design with InstaDri Skin-Caring System™ for increased dryness. The 100% breathable Air-Dry Layer™ backsheet lets air circulate, preventing dampness on the skin and improving user comfort. The shape of the TENA Flex Maxi Briefs leaves the hips and thighs uncovered, preventing chafing or sweatiness; and odor control for total freshness. Gray color is more clothing-like for greater incontinent patient dignity. Extra wide flexible stretch belt provides greater comfort. Conforms to the body's natural contours and movements. Ensures a snug, more comfortable, body-close fit. 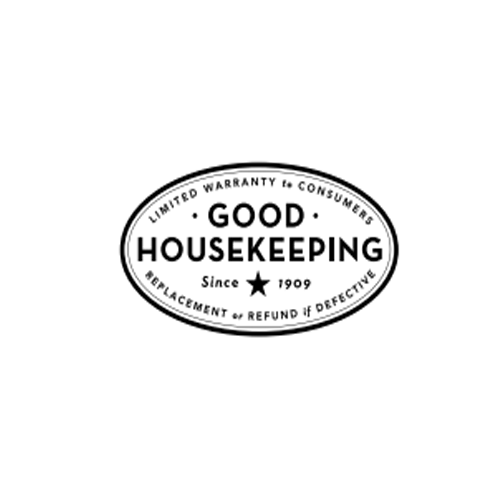 Soft, airy, non-irritating belt material. Skin-friendly textile covering and breathable layer retains liquid and odors while allowing water vapor to escape. TENA Flex Maxi Belted Briefs Product ID Numbers: 67806, 67807. Size Options: Medium (28 to 42 Inch Waist) to Large (33 to 50 Inch Waist). Designed for maximum overnight protection. Color of stripe indicates size and the number of drops indicates absorbency level. Fastener Type: Hook and Loop. Absorbent core is thin for a better fit and greater comfort. Imprinted with visual application instructions. The Tena Flex briefs are fantastic. They provide lots of comfort with the extra wide stretch belt. The briefs give and take to the shape of your body while allowing unrestricted movement. They do not get so hot like other briefs because they can breathe.